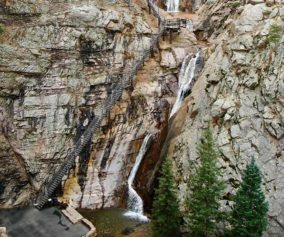 The hike to Catamount Falls is a moderate 2.8 mile loop hike about 25 minutes outside of Colorado Springs. 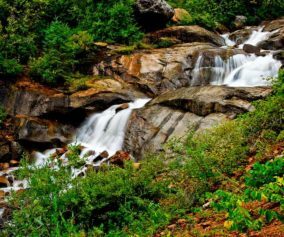 This waterfall hike takes hikers to three different waterfalls and over two different creeks that spill down from the heights of Pikes Peak. It makes for a great weekend adventure, coupled with a great opportunity for brunch at the Pantry in Green Mountain Falls. 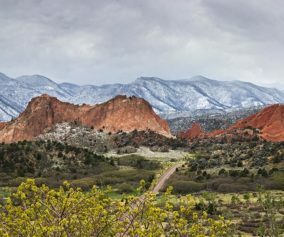 Explore the full Catamount Falls hike profile below for driving directions, trail route description, and more tips and details to help you enjoy this adventure near Colorado Springs. 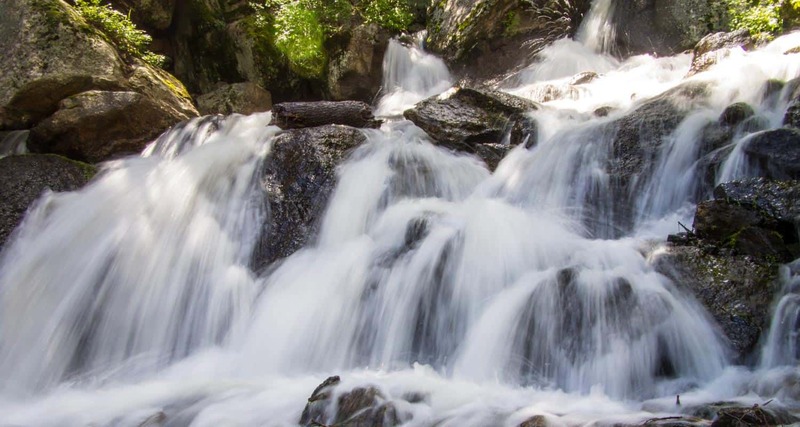 The hike to Catamount Falls starts at Thomas Trailhead in the quaint mountain village of Green Mountain Falls. However, since there is no parking available at the Thomas trailhead, the hike must be started from the Gazebo Lake parking area in town. To get to Gazebo Lake, from interstate 25, take exit 141 and go west on Cimarron Avenue/US 24 for 13.5 miles to the Chipita Park/Green Mountain Falls exit. Following Green Mountain Falls Rd/Ute Pass Avenue for approximately 0.7 miles. Take a left onto Lake Street. Here you will find the parking area that lines the north side of the small lake. The loop route below requires two segments along the streets of Green Mountain Falls. The first 0.4 mile segment of the hike will takes hikers from Gazebo Lake to the Thomas Trailhead. Beginning at Gazebo Lake, walk the roadside of Ute Pass Avenue that follows the southern edge of Gazebo Lake. Take a right at the first intersection onto Hotel Street. The streets can be a bit confusing in Green Mountain falls, and Hotel Street will soon turn into Park Avenue. Follow Park avenue as it winds up to its intersection with Boulder Street, a dirt (and sometimes muddy) road that terminates at the Thomas Trailhead. Once on the Thomas Trail, yellow circle blazes mark the way. The initial stretch of trail leads to the base of the first waterfall on this hike, Crystal Falls @ 0.5 mile. 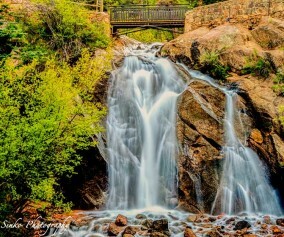 This set of cascades is formed by Crystal Creek as it runs down the mountainside from a Crystal Creek Reservoir, one of the lakes situated above Green Mountain Falls on the flanks of Pikes Peak. A bit further up the trail, there is an observation area for taking in the larger leaps of the falls. The next 0.7 mile segment of the Thomas Trail leads to the second waterfall, Catamount Falls, and is the more demanding portion of the hike. The trail climbs west/northwest until it arrives at Thomas Trail Memorial. After the memorial, Catamount Falls is just a short ways further up the trail. A spur trail leads from the left/south to the site of Catamount falls. From Catamount Falls, the next segment of trail goes north to take hikers back into Green Mountain Falls. Yellow blazes mark the way across the creek and back to the Thomas Trail. Soon the trail will encounter an intersection with the Catamount trail at the Catamount Trailhead. Staying on the Thomas Trail, it will cross a small footbridge where a third small waterfall can be viewed. The trail then terminates at Belvedere Avenue. Here, the final 1-mile segment of this loop hike begins. Taking a right onto paved Belvedere Avenue, it will lead east, back into town. Belvedere Avenue will eventually merge with Ute Pass Avenue. Going South/Right on Ute Pass Avenue then leads back to Gazebo Park. You may be wondering, “What is a ‘catamount? '” A catamount is a mountain lion, also known as a cougar. The Catamount Reservoir and Catamount Creek are both named after this creature that lives in the wilds of Colorado. Watch for yellow markers: These will guide you along the Thomas Trail. Get there early: This can be a crowded hike on the weekends. Parking: Out of respect for the residents of Green Mountain Falls, refrain from parking along the roads near the trailhead. Instead, park at Gazebo Lake and follow the trail description above. A Shorter Option: For those looking for a less demanding hike to just one waterfall, follow the route above to take in Crystal Falls only. This makes for a less demanding 1 mile, out-and-back hike. Photo: We would like to express our gratitude to Ethan Beute for sharing such an amazing photograph of this hike to Catamount Falls in Colorado Springs.